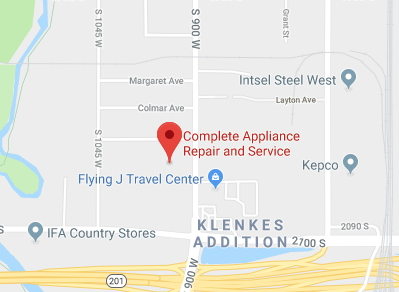 Quality appliance repair in Bountiful, Utah means working with a reputable and local company you can trust. We specialize in refrigerator repair, washer repair, dryer repair, ovens and stoves repair, and dishwasher repair, and we know all appliances small and large need a little TLC from time to time. Fortunately for Utah homeowners, help is close by with Complete Appliance Repair at your fingertips—with same day service available even on Saturdays. This locally owned family company has repaired all makes and models, from vintage conversation starters (like your grandmother’s “heirloom” freestanding oven) to the latest high tech-laden gadgets. Here are some of the services offered to our customers in the Bountiful area. Is your refrigerator running? If not, you better act fast to avoid spoiling costly goods. A leaky refrigerator can cause severe flooding and structural damage if not addressed early. A refrigerator that stops working completely means you need to act fast to preserve perishable foods (which is why having an extra fridge or freezer in the garage is a good idea). From strange tasting ice to a hum that is getting out of control, you deserve a perfectly working refrigerator. What if it doesn’t all come out in the wash? Washers need routine maintenance and sometimes repairs in order to conserve water—and ultimately keep your utility bill reasonable. Signs of a washer going awry include failure to drain or spin, clothes that don’t get clean, leaks and of course a machine that just isn’t working. Many times, repairs are quicker and more affordable than a replacement. If your dryer is leaving you high and dry, it is time to call in the experts. An ill-working dryer can waste electricity, fail to dry or get stuck on a very high heat—and even be a fire hazard. Putting a dryer right next to a washing machine makes sense, but electricity and water just don’t mix. Both machines need to be in tip top shape for your safety (and the safety of your clothes). What’s cooking? If the answer is not much thanks to a cantankerous stove or oven, that’s not just an excuse to order take out—it can be a major fire or gas hazard. Never try to repair this kitchen staple yourself. Let Complete Appliance Repair take care of this kitchen duty round for you. The unsung hero of the kitchen, most homeowners do not realize how much they rely on their dishwasher until it’s not working or it’s leaking all over the place. If your dishes are coming out with gunk on them, you notice a leak or the machine just is not performing, you might be wasting water or even eating off of dirty dishes. That needs to be addressed pronto. For “complete” care of your appliances, give Complete Appliance Repair a call today.